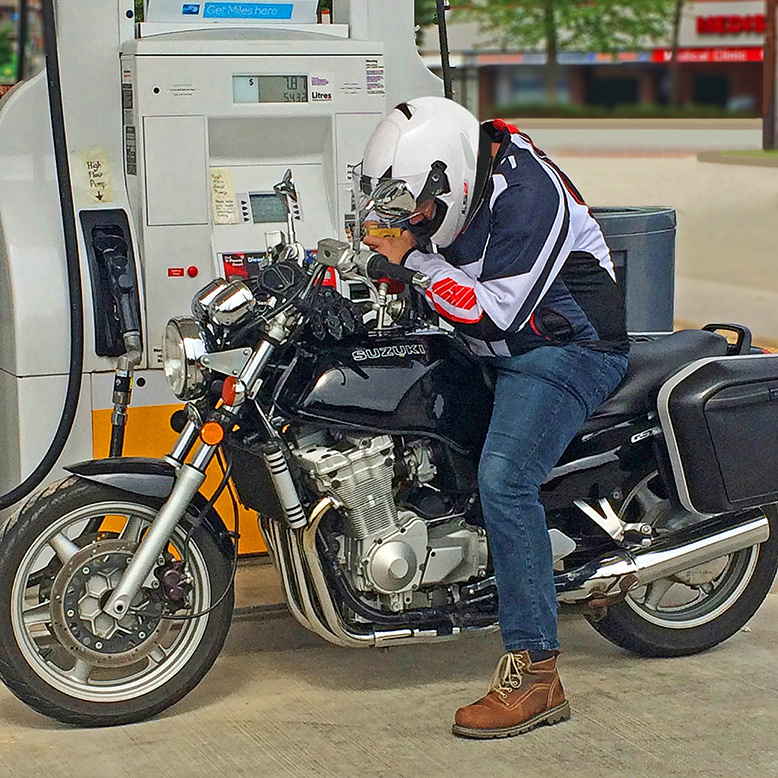 Here’s why you should get off your motorcycle when fuelling. The nice part of filling up your motorcycle is you don’t have to worry which side your gas cap is on, and there is really only have a few points to remember. Number one is to turn off the engine. Number two, is get off your motorcycle. What! you say, but you are a busy rider. You aren’t gassing up. This is a pit stop. There are enough shocking pictures on-line of the consequences of refueling gone bad. Nasty stuff. You stretch your legs and orient yourself to the surroundings. You can check for any oil and slippery contaminants on the fuel deck. Putting your bike on the centre stand (If you have one) stabilizes the bike and levels the fuel tank. This is not carved in stone. Depending on your specific model, and if you’re carrying cargo, muscling it onto the centre stand can be an unnecessary ordeal. Gasoline has been around so long that that it can sometimes be taken for granted. It is a highly volatile fuel. It’s not actually the liquid that burns, but the vapours that ignite. Even a static electricity charge is enough cause an explosion. Gasoline on your skin dries up the natural oils and fats causing cracks where secondary infections can occur. There are different views on the use of cell phones. Historically, they have been cited as a potential ignition source, but The FCC states there is no evidence that these reports are true. While it may be “theoretically possible for a spark from a cell phone battery to ignite gas vapour,” the FCC concludes the potential threat is remote. Other sources say they are a source of distraction when used while filling up. Almost universally, fuelling is done with a hot engine. Some models offer more shielding than others, but the simple fact is you are dispensing a highly flammable fluid over a significant heat source. Think about it. Although uncommon, if something did go wrong during the fill up, do you want to be sitting on your bike? Gas station safety information references the scene they have all seen repeatedly. Riders scrambling to dismount usually drop their motorcycle, which causes a fuel spill and now they are endangering others at the station. In extreme cases, you might see negligence charges brought against you. Riders sitting astride their machine with their helmet on peering into the filler hole trying to judge how much fuel they are using are newbies or unconscious run-with-scissors types. It’s easier and safer to do that off the bike and without a helmet. You can usually better hear the gas rising to the top. Don’t overfill your tank. There needs to be an air gap. Fuel expands as it gets hot and motorcycle tanks are generally on the top so ideal to be baked in the direct sun. If you are caught in a flash fire, during fueling, do not pull the nozzle out. Some think they are acting intuitively by pulling the nozzle out and they will save themselves, their vehicle or those around them. Nothing is further from the truth. The inferno comes from the nozzle being pulled out of the vehicle or container and the gasoline being sprayed around the area.